The enablers say Americans need to quit thinking about it and just do it already. NEW YORK—Scoffing as they stood behind a podium and held out their arms with palms upturned, members of the National Association of Enablers held a press conference Monday urging Americans to c’mon. The group of leading enablers from across the country reportedly convened this week with the express purpose of persuading the entire U.S. populace to stop thinking so hard about everything and just get on with it already. Grimm then reportedly paused for a few seconds, put his hands in his pockets, and jutted his chin out before repeating the phrase several more times. According to reports, getting the nation to c’mon has been the foremost initiative of the National Association of Enablers since its founding in 1985. Sources confirmed the group has since expanded its presence to nearly every corner of the country, fulfilling its mission to tell residents of all 50 states that they really need to lighten up and just go for it. 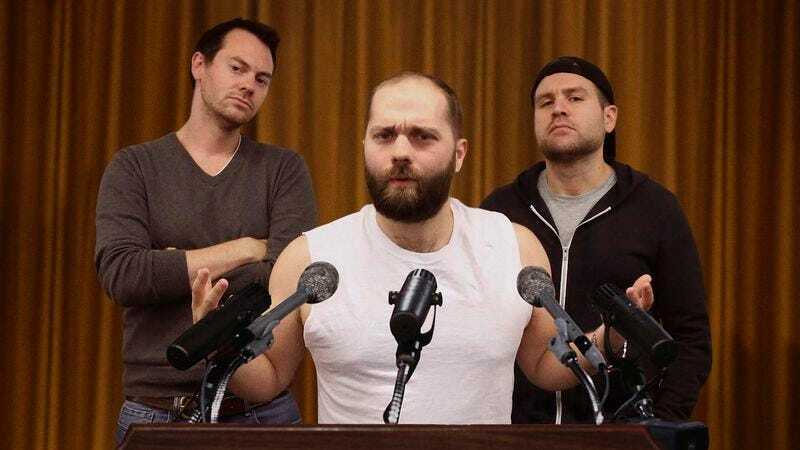 At that point, sources reported that one of the enablers standing to Grimm’s side, who was said to be clad in a tank top that revealed imposing musculature, leaned over to the microphone and pleaded with Americans not to be a bunch of wusses, especially when what they were talking about wasn’t even that big of a deal. The enabler then insisted there was nothing stopping the nation’s 324 million people from just doing this, and he stated, furthermore, that they’d probably like it anyway. At press time, the American people had reportedly hung their heads in unison, looked sheepishly down at their feet, and reluctantly given in.